I am an artist, retired from the real world of 8 to 5 jobs. After spending 60 + years in Phoenix, Arizona, I moved to Fargo, North Dakota. Spent five years there, then returned to Arizona in the summer of 2015. While in North Dakota, most of my time was spent caring for my granddaughter and the household pets. Other times, usually late at night or on the weekends, I did my artwork. Now that I’m alone again, I do my artwork any time of the day or night. Currently, I work with acrylic, oil, ink, charcoal and mixed media. 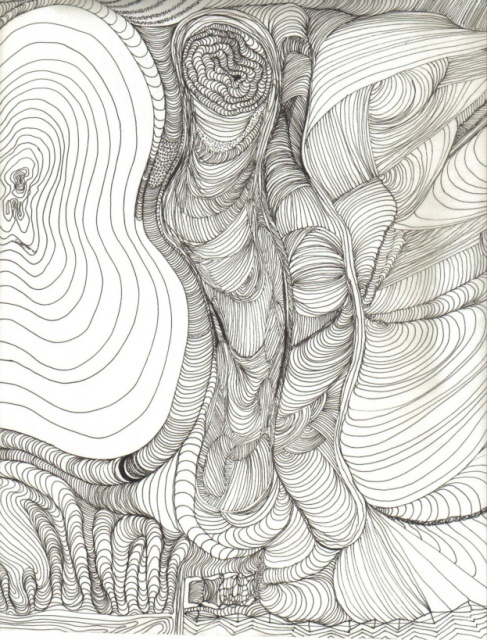 Below is one of my ink drawings, at least a portion of it. Hi Pam, Just dropping in for first time and reconnecting with long term friends. Following you and Regards Kent. Dear Kent has since passed away. Bless you and R.I.P. my friend. What’s this?? You’ve moved back to Phoenix? Wonderful! Good grief! I thought you had permanently given up control of your life to the Controlling One of the North! Really glad to see that you haven’t; I know you were unhappy up there. I’m “Following”, but got no word of this … nobody tells me anything. Yeah, I know I’ve been out of the loop, with all this recuperation I’ve been doing, but still, I ought to have seen something! “Kent1112” = “Hagar the Horrible” from MyOpera? Pity … I liked him. Yes back in Arizona. Thankful for th warmer weather. Lived with my son for a few months till I found a place. The Kent that passed away was Kent Olsson of Norway. I don’t know if it’s the one you are thinking of. Tapping this from my phone and hate doing it. Hope to get a new computer in the next month or so.